It was now into 1937 and I had still attended my First Aid lectures at Cheltenham followed by National Competition in London and Bristol. 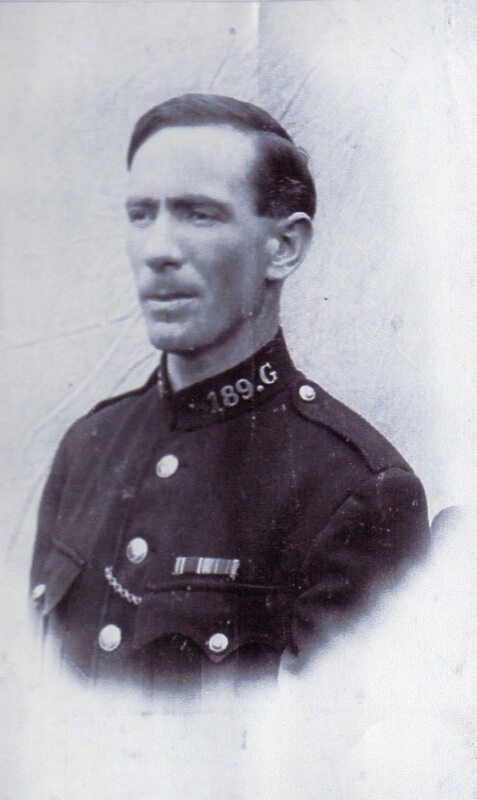 I had now passed try examination for promotion at Cheltenham and I was still hoping, instead the Chief who had promised me promotion had retired and the Supt I was then under moved elsewhere, and on the 1st January 1938 I was transferred to Cheltenham to take charge of a growing district at Prestbury. The parishioners at Twyning presented me with a gold watch suitably inscribed and it says from his friends upon leaving Twyning. I think this was one of the last presentations to be made to a Police Officer leaving a district or otherwise because the Chief Constable issued an order forbidding such presentations. downstairs. Another application and I was able to have another phone alongside the bed, what a difference all these things made to comfort of the house. 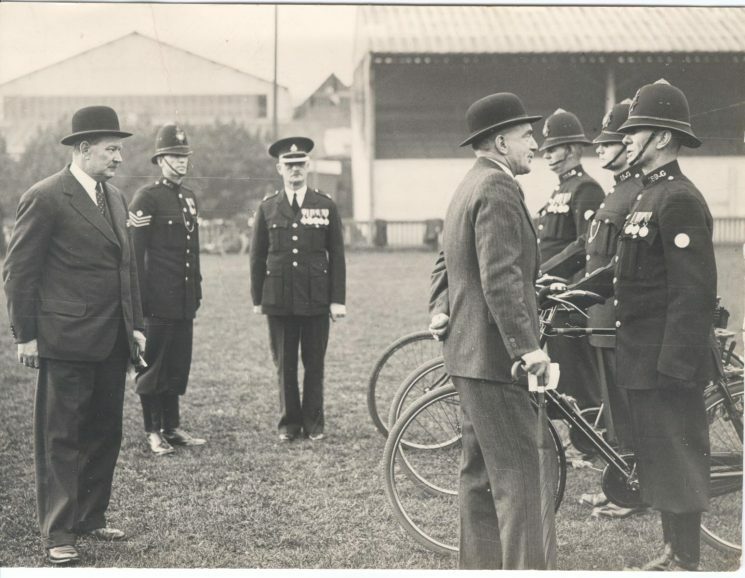 His Majesty’s Inspection and parade at the Athletic Ground Cheltenham 1938 Police Constable Lodge talking to the inspector Mr Johnson. Cheltenham Urban Division Prestbury Section. 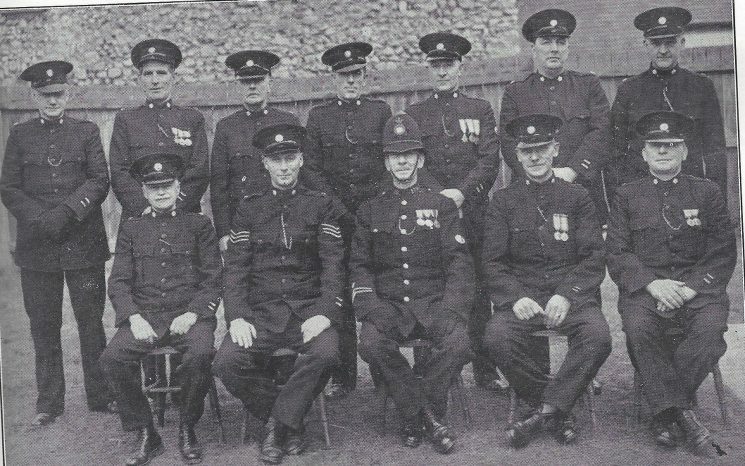 Back row: Special Constables Lee, Brookes, Harrison, Newman, Brockman, Gurney, Short. It was now 1939 and war was imminent and that meant getting my special Constables list up to date and getting them fitted out with their appointments etc. There were about 14 Special Constables attached to my station. They were made up from all walks of life, rich men and poor men. War was declared which entailed a lot of extra work, beside receiving Air Raid warnings and passing it on to other posts. A section of S.C.s reported for duty every night and they used my back kitchen for their room but it wasn’t long before I found them a room across the way where they could be on call and on their own which I think was better for all concerned. Air Raid warnings were coming very frequent now and it is about time that I mentioned my wife because if ever a lady deserved a medal she did. All the time I was on duty she would take over duties at the Station for no reward or payment from the Police Force, which I think was very unfair. I won’t go into detail but during the war there was 1 500lb dropped in a field about ½ mile from the station also 200 incendiary and 2 oil bombs but thank goodness there was no damage to property or person. The hole made by the 500lb bomb fell into safe ground and the depth of the hole was approx. 40 feet by about 20 feet and caused a fair amount of damage to dwelling house in the working class district and causing 23 deaths. Also the Gas works and a factory was hit. When Bristol was being raided I was lent out with about 20 other officers from the County to give them help. I was there for 5 days and luck was with me there, as I caught a man looting and warehouse breaking. He was tried at Bristol Quarter Sessions which meant I had 1 or 2 trips to Bristol. The man got a month and I got a Public thanks from the chairman of the Quarter Sessions and a commendation from my Chief Constable. I returned home to my own station and resumed duty and very thankful I was too after the upheaval at Bristol and my wife having to take charge of the station during my absence. It wasn’t long before I had to go to Bath to help out there where they too had been hit pretty bad, also to Filton for a couple of days where a bomb hit a shelter with about 120 persons in it. They were all killed. They were let lie where they had been killed and buried and I believe a memorial was erected over the spot. Crime in Prestbury was not great and which I will not relate although it was very varied considering the size of the district which had grown to a large locality. 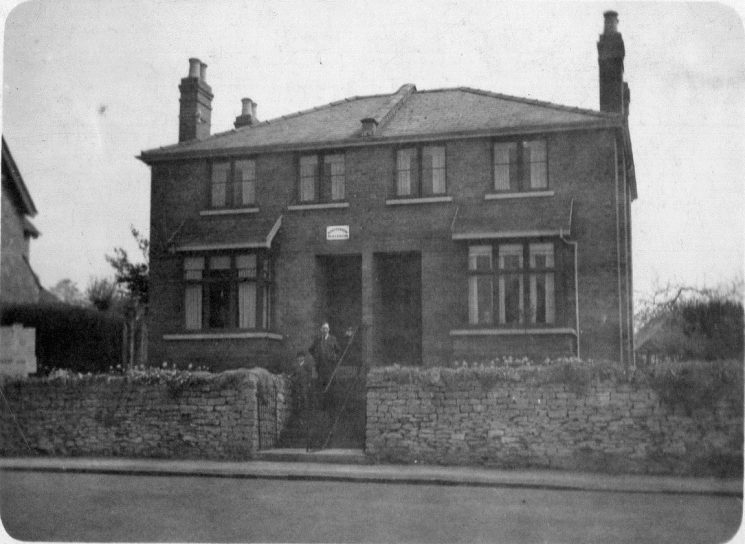 1000 houses was being built at Whaddon, 220 houses at Cleevemount, 175 prefabs near Whaddon. I had besides this growing population an American Army camp, an English Army camp and a German prisoner of war camp and an American coloured gun crew camp about 30 yards from the Station. 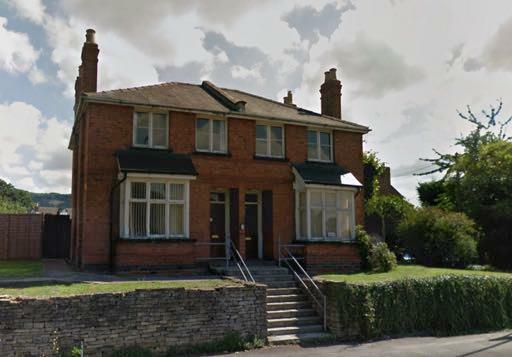 – I was now given another officer to be stationed with me to help me out and after the war was over a Police Station was installed at Whaddon and my man was eventually taken from me to be stationed at Whaddon under a Sergeant and 4 men but I remained at Prestbury. I must not pass without relating a very funny incident involving my wife. One night about midnight I had a phone call from the General Hospital, Cheltenham, requesting me to inform 2 old spinster ladies in Shaw Green Lane that their father was dying and would they please come as soon as possible. I was suffering with influenza at the time and my wife said she would like to go. I tried to dissuade her but she went and when she returned she informed me that the old ladies had told her that their father had been dead for years. The same name, but the relatives of the old man in hospital lived in another district, still we did not mind if we could help the Hospital. It was about now that I had some funny incidents, at about 7pm one evening I was on duty and stood at the cross roads near the station and I saw a motor car coming towards me without lights and going no faster than walking pace. I thought I was seeing things but when it got to me I saw that its occupant was a Captain in the Army. I stopped him and he got out and he was very drunk. I eventually took him to the Central Station in Cheltenham where he was charged and brought before 2 magistrates the next morning. He was fined £20. His licence was not endorsed neither was it publicised in the paper nor the Army authorities informed. Just one of those things that are forgotten and his career was not jeopardised. Different to the soldier who stole a motor cycle from Cheltenham, and who I found wheeling the machine on the Prestbury Road. He ran away but I caught him in about 100 yards after jumping on the running board of Mr Wilson’s motor. I’m afraid he hurt himself in the face. He was taken to hospital and on his discharge I attended the Court Martial at Shepton Mallet. He was punished with detention. Needless to say, that motor cycle was recovered before it was reported stolen, another commendation, just luck. In November 1946 1 developed a varicose ulcer in my foot and I went to bed for 13 weeks. Anyhow the medical got it better and the next year I went to bed with another ulcer in my left foot which means 12 weeks off. I got better of this and up to my ulcer trouble I had enjoyed good health. Swimming, running, cricket, football was my hobbies. My sons were now growing up and one was articled to GAC as a draughtsman and a couple of years later my youngest son was articled as draughts-man at Dowty. My second son was unfortunately taken ill and was at a Sanatorium for 1½ years with a Spinal graft but he recovered from his illness and now in 1964 he is at Smith’s factory thanks to his own ability. I had now got 27 years service in with the Police Force and the Rural District Council offered me a new house in one of the nicest parts of Prestbury so I seized the opportunity knowing that opportunity only knocks once in many cases. I made application to retire on pension, this was granted and I retired on pension at the age of 51 to become a clerk at the Cheltenham Echo Office a few days afterwards. Thus ended my career in the Police Force and strangely enough 2 pals, who I had joined with and retired 3 years after I did, they were like me overlooked in the promotion list, but I can honestly say I was never jealous of a man getting promotion but sometimes envious. This page was added on 26/11/2018.